I didn’t manage to find Barry M’s mushroom in either Superdrug or Boots but I did get some of the other polishes I’d been after for a while. As you can see I took full advantage of the Superdrug/Boots 3 for 2 offer! Revlon Minted (028), Revlon Lilac Pastelle (031), Barry M Berry Ice Cream (308), Barry M Pale Turquoise (295), Barry M Pale Pink (309) and finally Barry M Pink Iridescent (264). Nails Inc Elizabeth Street, Barry M Bright Pink (279) and Barry M Gold (289). Barry m’s lip gloss wands smell amazing but this orange one has to be the nicest! It smells of starburst! It looks scary in the tube but worn lightly it can look lovely. Not so sure about the toffee one, once again it smells divine but I wish it didn’t have so much shimmer in it. 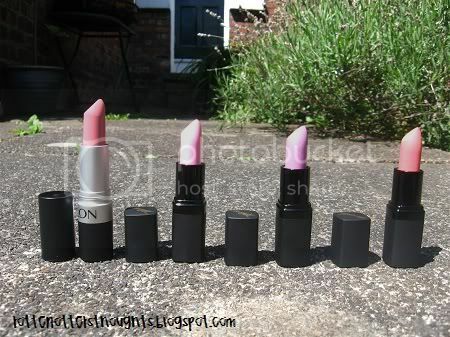 I love these Revlon glosses too, they are so pigmented and perfect summer colours. Ooh, I love the gold and Ice Cream nail polishes! And number two gloss looks amazing! @Stevie, thank you :) I actually wrote this Friday and scheduled it for today so I'm really right as rain now! 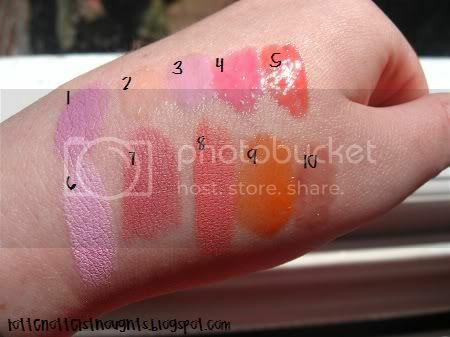 The 7th swatch looks a lot more like Revlon Pink about it than Revlon Pink Pout! Pink Pout is a blue-ish pink, Pink about it is closer to hot pink and coral. @Ms Wedgie, don't be scared by it! I was at first but then I saw it in someones FOTD (annoyingly can't remember who) and they wore it alone and quite sheer, it looked amazing!